First, campaigners petitioned to send Egypt’s President Mohammed Mursi into space. It was an unusual stunt which gathered pace, but remained trivial all the same. Now, another group opposing the Islamist presidency appears to be more headstrong about their cause. 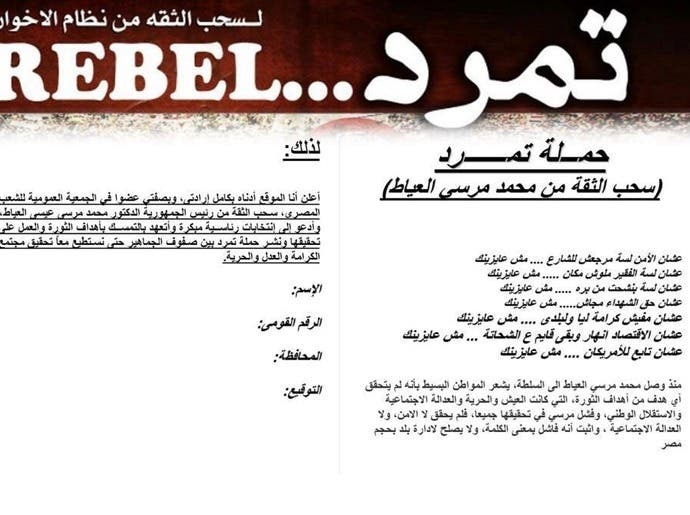 A petition named “Tamarod” (meaning “rebellion” in Arabic) is gathering signatures to call for Mursi’s ouster. Organizers are pushing the document with the aim of “withdrawing confidence” from the president. So far, organizers have said that the petition, which is calling for early presidential elections, has gathered over two million signatures. “We have gathered over two million signatures to withdraw confidence from the president (since May 1), which shows that people have suffered a lot from the political crises and the economic situation,” Tamarod spokesman Mahmud Badr said in a statement on Tuesday. “Because security has not returned, because the poor have no place, because I have no dignity in my own country... we don’t want you anymore," the text reads on the slip of paper being presented by “Tamarod” members petitioning across the company. “The campaign was launched because the president is no longer able to manage the country,” the text adds. According to organizers speaking to Egypt-based Ahram Online, the campaign is currently active in 19 out of Egypt’s 27 governorates, as well as in nine foreign countries. But analysts are skeptical over whether the Egyptian government will pay attention to the petition, despite it calling for a mass protest outside the presidential palace on June 30. The date marks Mursi’s first anniversary in power. “It is unlikely the government will take much notice of this petition, or that much will happen on June 30,” Dr. H.A. Hellyer, a nonresident fellow at the Brookings Institution and a specialist on Egyptian politics told Al Arabiya on Tuesday. A spokesman for the Freedom and Justice Party (FJP), the political arm of the Muslim Brotherhood, has dismissed the campaign. “The only recognized democratic mechanism is the ballot box. Everyone must respect the results of the ballot box no matter what they are,” Ahmed Rami said in a statement, reported by AFP. Mursi’s tenure has been marked by severe economic crisis, political turmoil and deadly protests. 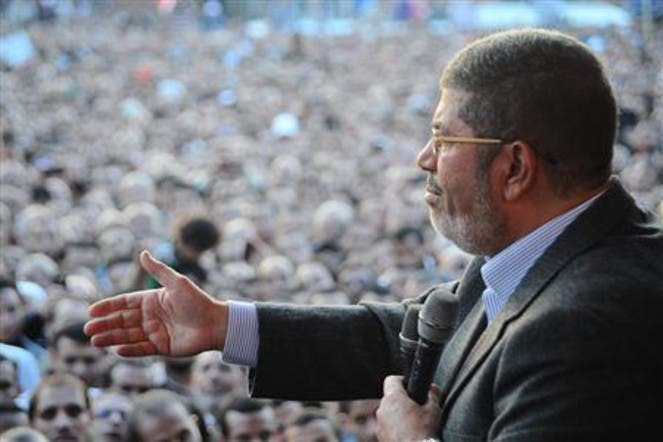 His opponents accuse the president of placing the interests of his Muslim Brotherhood above those of the nation’s. Claiming to employ some 6,000 volunteers, the group says it has already managed to collect more than two million signatures – with 800,000 signatures claimed in Cairo alone. While the movement was officially established on 22 April, it only began campaigning in earnest on 1 May. “Tamarod” has been intensively active on social media platforms. Although some Twitter users have questioned statements from the campaign. “How can we be certain that the “Tamarod” campaign collected indeed more than 2.5 million signatures?” asked Twitter user @Nael_Shama, a political analyst based in Cairo. Other users questioned what will happen next. “Tamarod [Campaign] it’s a really good move but after people sign it , where it will go ?! what authorities it will do to us as Egyptians ? !” asked Egypt-based tweep, Ziad Ashraf. The campaign reminded many of the 2010 petition by reform campaigner Mohamed el-Baradei demanding constitutional reform. He began the effort before Egypt’s Tahrir Square uprising but it managed to collect one million signatures in less than seven months. “The entire practice [of signature collection] had not actually existed in the country until 2010 when Mohamed el-Baradei founded the National Assembly for Change, which started collecting signatures on a document that listed a series of demands seen as a step towards democratic reform,” Sonia Farid, a political analyst and professor at Cairo University, wrote last week. “Technically speaking, the signatures neither modified the articles of the constitution … but they did change the face of the political scene in the country and effected an outstanding transformation in the balance of power between the ruler and the subjects,” Farid added. Meanwhile, a campaign aimed to counter “Tamarod” is surfacing, it includes “a handful of counter-movements” showing solidarity with the president, Ahram Online reported. In Upper Egypt, a member of the country’s ultra-conservative al-Gamaa al-Islamiya group, announced the launch of a counter-initiative in the city of Qena.